« Yellow Highlighter Cured Cancer?!? Tailbone Pain, Coccyx Pain. 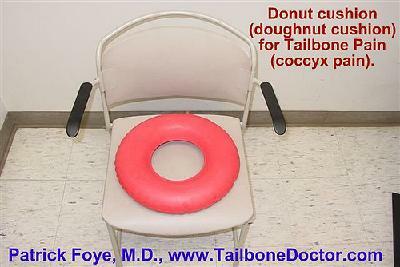 I did a small research study evaluating whether patients with coccyx pain (tailbone pain) preferred wedge cushions versus donut cushions (doughnut cushions). The abstract was published in 2009. The results: Among patients with coccydynia who tried both types of cushions, many patients preferred neither. But patients with a preference were almost 5 times more likely to prefer wedge cushions as compared with donut cushions. OBJECTIVES: To assess which types of cushions are better at relieving tailbone pain for patients with coccydynia (coccyx pain). Specifically, the objective was to study these patients’ preferences comparing donut cushions (circular cushions with a hole in the center) versus wedge cushions (cushions with a triangular wedge shape cut out posteriorly to thus avoid coccygeal contact with the cushion). RESULTS: At the time of the study, charts were available for 171 patients with coccydynia, all of whom had been evaluated by a single physiatrist at a university-based outpatient musculoskeletal/pain practice. 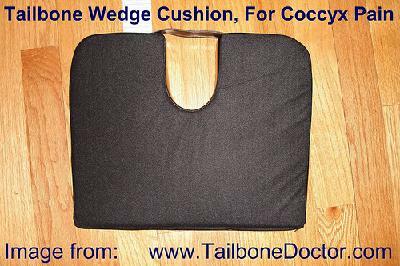 Within the patients’ initial evaluation notes, there was documentation that 55 (32%) of these patients had tried using both coccyx wedge cushions and donut cushions, including 40 females and 15 males, with an average age of 49 years. Of these 55 patients who had tried both types of cushions, 19 patients (35%) preferred the wedge cushions, while only 4 patients (7%) prefer the donut cushions. 4 patients (7%) liked both types of cushions equally, while 23 patients (42%) preferred neither type of cushion. CONCLUSIONS: Among patients with coccydynia who tried both types of cushions, many patients preferred neither. But patients with a preference were almost 5 times more likely to prefer wedge cushions as compared with donut cushions. This data may help guide patients and doctors regarding which cushions to try first. 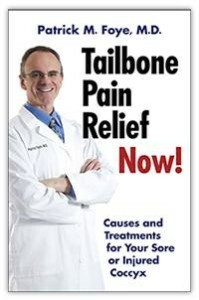 Book: “Tailbone Pain Relief Now! 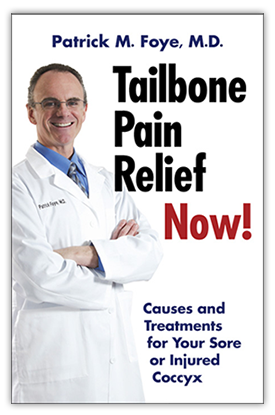 Causes and Treatments for Your Sore or Injured Coccyx” by Patrick Foye, M.D.